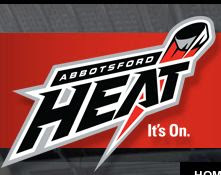 the abbotsford heat logo is finally revealed and it's... well.... it's better than the quad city flames' logo, that's for sure. anyhow. onwards and upwards, abbotsford heat !!!! I'd actually argue it's worse than the QC logo, because this is about as cliche as you get — masculine lines, a flying puck ... way to build an identity, guys! The Flames continue to be the franchise that taste forgot. Drives me nuts. no way it's worse than the flaming QC; with no font qualities whatsoever. y'know... the "flaming O with a kickstand." at least this one "represents all the power and passion of the sport through this reference to fire, in both the team name and logo." agreed... aside from the fact that the team was named after its home state spelled backwards, that logo was kickass. The part that concerns me is the "It's On" portion. Are we to be assaulted with Glenn Fry the few times a year we drive out to valley to watch the Moose play? the it's on part is, of course, the catchphrase on the website that i screencapped and not actually part of the logo... i'm sure you understand this but are still mortified by the cheesiness of the entire situation (as am i). but yeah. i can't wait for the heat to slaughter the moose. bring on the schedule !!!! I don't know why they didn't go with the old Atlanta Flames "A". Calgary still uses it for their alternate captains' patch. It just makes sense since Abbotsford does in fact start with an "A". Plus the new logo just looks like every other minor/bush league logo. I guess I get frustrated with all this garbage since I have a design background. but, yeah. that jersey would've been shithot.